I've switched from researching/reenacting the Baltimore Historic Trails (though that documentation needs work) to walking the Defenders Trail along the North Point peninsula. There's a great, but somewhat dated and fuzzy, guidebook authored by Buzz Chriest that I'm using to find my way. My hike on January 15, 2011 was more physical exercise than historical research, as I left the book in the car, on purpose, and simply walked along North Point Boulevard. I spotted two of the historic markers along my route. I began at Saint Monica Drive, parking my car near the entrance to the community of row houses to the west. It's probably called Battle Grove, although redevelopers may have cuter names by now. I wanted to view the site of the defunct North Point drive-in movie theater, which contains only transient vestiges of motion picture audience participation. The location of the screen has concrete footers, presumably cubic yards of the stuff, and rusty sawed-off bolts where the framework was anchored. A modern-day construction entrance, complete with gravel intended to prevent soil from leaving the site, stands as a warning that these bones of the 1950s/1960s drive-in movie popular culture icon will soon be taken away for burial or perhaps reuse as road fill. Heading generally south on North Point Boulevard, I soon reached Wise Avenue, passing the intersection with old North Point Road along the way. The major landmark at Wise Avenue, for as long as I can remember, is Pop's Tavern. Between Wise Avenue and the Beltway interchange are many industrial buildings, some off-shoots of the now-shrunken Bethlehem Steel mill at Sparrows Point, and other major and minor chemical, maintenance or construction facilities, with a smattering of restaurants and bars. After walking under the railroad and Beltway bridges, I jogged (meaning shifted, not running) over Bethlehem Boulevard to North Point Road, and the route to Fort Howard. Before the highway build up, North Point Road probably hugged closer to the waters edge, but this has been erased by time. 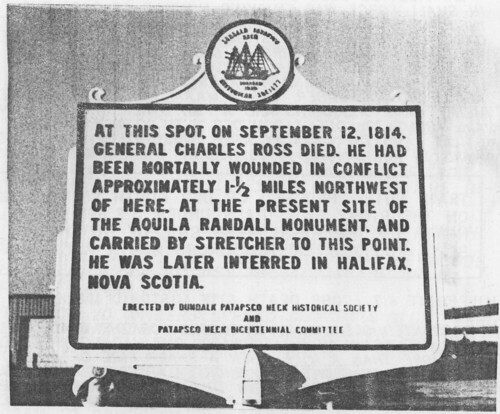 The Edgemere neighborhood on both sides of North Point has streets named for characters of the War of 1812, including Wells, McComas, Armistead and Ross. See myedgemere.com for more information on the history of these names. The Aquilla Randall monument is northeast of where I started my hike, so I need to visit that on a subsequent stage. At first I thought this was a neighborhood snowball stand or something, but I'm not really certain. Whoever created it has flair and technique. On the way back to my car I took shots of the historic marker on the west side of North Point Boulevard that I had spotted on my way south. Besides being nearly embedded in the industrial area fence, it has a curious "overwrite" of the General's first name, on both sides, as if he had been misnamed on the first try and then renamed afterward. Recent historic photo (1980s?) of the marker, showing the underling first name. Not a bad start with a chilly, brisk winter's day.